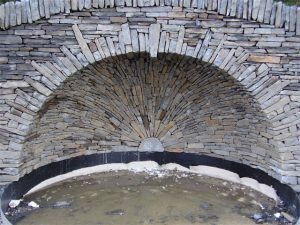 The Dry Stone Walling Association of Great Britain Pinnacle Award Scheme was set up in 1994 to recognise outstanding projects incorporating dry stone walling. 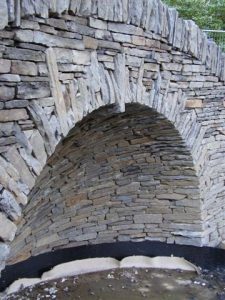 Although the scheme is designed to embrace a wide variety of dry stone work, only projects displaying the very highest levels of craftsmanship, innovative design and inspirational use of stone can be considered for a full Pinnacle Award. In circumstances where a project falls short of the exacting criteria of a full Pinnacle Award the project can be submitted for an award of merit under the scheme. The Certificate of Merit still requires the project to display the very best workmanship but perhaps on a smaller scale or with less design involvement than would be required of a full Pinnacle Award. The Certificates of Merit are also split into several categories to help promote different areas of the craft; these categories include agriculture, architecture, conservation, forestry, historical restoration, landscaping and public works. Since the scheme’s inception twenty one years ago, only eleven full DSWA Pinnacle Awards have been presented, the first one in 1995 for a black house built on the Isle of Lewis. This first award was then followed by an award for garden features at Portrack House in Dumfrieshire in 1995 and the landscape sculptures at Lothian in 1998. With the coming of the new millennium there was another flurry of applications for the DSWA Pinnacle Award, including the garden features at Longdean House Heartfordshire in 2000, the ornamental lake in Alexandra Park Oldham in 2001 and the extensive Cumbria Sheep Fold Project in 2003. 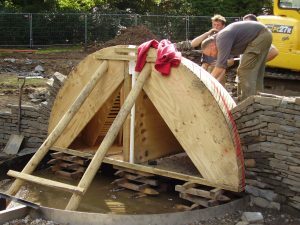 Following this, further awards were made to the garden restoration project at the Manor Temple Guiting and to a dry stone clad straw bale house near Milton Keynes in 2006. The last three presentations made under the scheme for full awards were made in 2009, 2014 and 2015 respectively for the One World Garden in Chelmsford, garden features at a private residence in Cumbria and The Sanctuary on the Isle of Skye; as I was fortunate enough to be the recipient of these last three awards I am able to go in to more detail regarding the design and construction processes involved in completing the projects. In this first article I will deal with the One World Garden. Constructed in 2008 in Highlands Park on the outskirts of Chelmsford in Essex the One World Garden was designed by Chelmsford Borough Council to commemorate the centenary of the scouting movement by Sir Baden Powell. The garden is situated within Highlands Park, a large public amenity open space on the outskirts of Chelmsford. 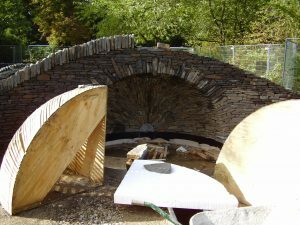 I first met the Council’s representatives while exhibiting at Chelsea Flower Show in 2005 where we discussed the possibility of them using dry stone walling in their plans. Shortly after the show they sent me the designs for the One World Garden, they had proposed that the centre piece was to be a three metre diameter half domed recess over a circular pool. 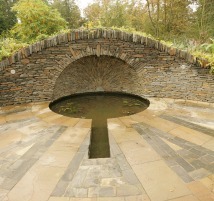 The other main feature of the garden was to be a sunken dell surrounded by a circular retaining wall. 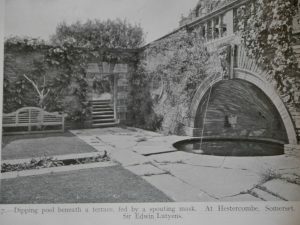 Obviously the half domed recess was going to be the most difficult element of the garden to construct although I was aware that there was a similar structure at Hestercombe Gardens in Sussex designed by the famous architect Sir Edwin Lutyens. Although the Hestercombe feature was mortared, it gave me a starting point to study and work out how to approach a dry stone version of the same structure. We had decided to use Blue Pennant Sandstone from South Wales as it was a good quality uniform building stone and readily available at a reasonable price. After selecting the stone I went about designing the former over which the half dome would be built. At this point I must thank my local carpenter who constructed the former, actually there were two as the structure was so big a single former would have been too heavy to move. When we arrived on site the former was placed in position propped up on wedges to enable us to remove it easily when the half dome was complete. It was at this point I realised that I had missed something; not only did we have to build this incredibly complex structure but the retaining wall it was contained within was curved. With this in mind I marked the radius of the retaining wall from its centre point over the former with a spray can, this now gave me a reference of the curve to build to. The next thing to get my head round was that all the stone laid over the former, to create the surface of the dome is laid blind, that is to say you can not see any of the faces of the stones you have laid, until the dome is finished and the former is removed. All this work within the dome was walled instinctively using intuition. The overall appearance of the finished dome was intended to replicate a sun burst emanating from a central point; with this in mind I had saved and put to one side any tapered stones that would help create this radiating pattern. All the stones were laid on to the former starting at the bottom working towards the top in rays, I also sprayed lines over the external surface of the former like spokes of a wheel to help me maintain the radiating pattern. Wooden former in position showing red line to indicate the radius of the retaining wall. Completed dome shortly after the formwork was removed. The other anomaly that became apparent was that at the front of the dome, where the opening over the pool was, there was to be an arch. This arch was not only to be built in a curved retaining wall, as already described, but because it was to be the front of the half dome the voussoirs had to come down the face of the arch vertically then instead of turning at ninety degrees to form the bottom face of the arch, they had to be dressed to the curve of the dome as they travelled over the radius of the former. Other than these slight hiccups the build was actually quite straight forward and progress was good. Competed half dome showing radiating sunburst pattern. When the arch and dome were complete and the time to remove the former had arrived we knocked out the wedges that supported it with a certain amount of trepidation and excitement, to my relief not one stone moved or settled and on closer inspection it was clear we had succeeded in creating the desired sunburst effect. With all these complex dry stone structures I feel the thought of building them is quite often harder than the actual act of building them, it is easy to over think things and I always find the best way to work out how to do something is to actually have a go and do it. Completed half dome from the side.